I recently spent a few days in Berlin. 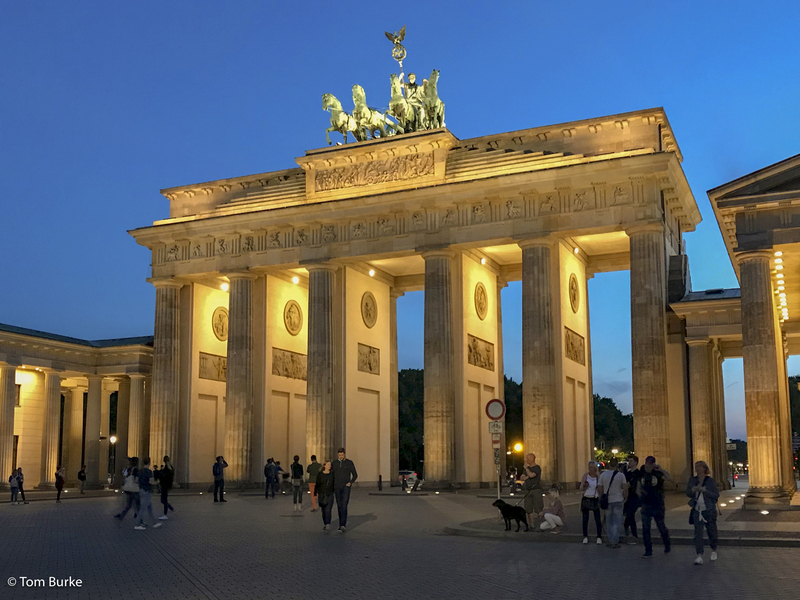 This was my first real visit to Germany – I’m not going to count changing planes at Frankfurt, nor even a day visit on a cruise to Warnemunde – and definitely my first first to Berlin. The summary is: I had a great time. It helped that the weather was great – blue skies and temperatures around 25º – but I also found the city endlessly fascinating. Of course, it played straight into one of my great interests, history. Berlin has so much of that, both good and bad, and most of it very dramatic. I won’t go into a long detailed account of the whole visit. This post will contain a summary and then there will be two more posts about specific activities that I did and really enjoyed. I few from Manchester to Berlin Schonefeld airport with Ryanair, arriving mid-afternoon. I’d researched transport options from the airport into the city, and bought myself a 3-zone day ticket at Schonefeld Airport station. That would be valid on the S-bahn, U-bahn and regional trains of Deutsche Bahn, and I chose to get regional train RB14 from Schonefeld (the terminus for that service) to Alexanderplatz, the nearest station to my hotel. The journey took about 25 minutes, with just a few stops. (I could also have used the S-bahn but that would have taken longer, perhaps twice as long, with many more stops.) That RB14 train seems to run at 30-minute intervals throughout the day, and calls at the major stations on the StadtBahn, the string of stations through the city-centre: Ostkreuz, Ostbahnhof, Alexanderplatz, Friedrichstrasse, and Hauptbahnhof. I spent three nights in Berlin, so I had the late afternoon and evening of the first day plus two complete days after that. Then on the final day I just went straight to the airport after breakfast as my flight was at about 12 noon. As for what I did, well mainly I just walked around, getting a feel for the city. I made a couple of visits to each of Potsdammerplatz and the Brandenburg Gate; I walked past the Reichstag several times, as well as visiting it (to be covered in a later post); from the Bandenburg Gate I walked all the way up Unter den Linden back to Alexanderplatz; I walked all along the Ku’dam; I walked along the river from Hauptbahnhof back to Alexanderplatz; I did a long walk down Karl-Marx-Allee looking at some remains of the DDR (again, to be covered in its own post); and on the last evening I explored the Nikolai Viertel quarter for a while. There’s lots I didn’t do – for example, I didn’t visit any museums or galleries. Partly this was because I just wanted to get a feel for the city, and partly because the weather was so good it seemed a shame not to be outside enjoying it. (See here for a blog about another visit to Berlin in less good weather!) So I do feel another visit coming on. Perhaps in the late autumn or early winter – less good weather and darker days would lead me naturally towards doing things indoors. Finally, here’s a selection of images that I took during my wanders.